Companies like Abbotsford's Aggressive Auto Towing say work conditions for its drivers are more dangerous than ever and want people to slow down. There are also calls for a change to safety lights on tow trucks. 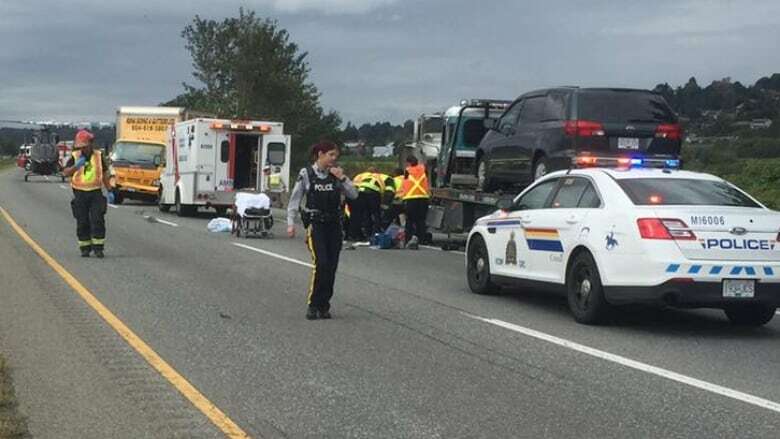 Abbotsford's Aggressive Auto Towing says it's going to be a long recovery for its driver who was struck by a passing vehicle on Saturday while working on the side of Highway 1. "From the reports we have, he has two broken legs, two dislocated knees, a large gash on the right side of his eyes, so he's pretty banged up," said Jason Davis with the company. Davis says two vehicles collided on the roadway, one spun around and hit the tow truck driver's door where he was about to enter the vehicle. The worker had just finished loading a minivan onto the truck bed. The crash is being considered a workplace incident, RCMP said, and WorkSafeBC confirmed it sent investigators to the scene. Meanwhile, Davis says accidents like this are becoming more common. "It's becoming more and more frequent," he said. "One of our guys, last year, got struck with a mirror. The guy came so close to him. Lucky it's not as severe as this one, but those close calls are coming more and more." On Friday, Partel Towing posted a video to its Facebook page showing a white SUV narrowly missing a tow truck driver working on the shoulder. Brain Van Heut works for Patel Towing and says conditions are scary. "It's horrible," he said. "A couple years ago a guy lost his leg in Richmond." In British Columbia, motorists are required to slow down and move over for all vehicles stopped alongside the road that have flashing red, blue or yellow lights, which are what tow trucks use. Van Heut would like to see that legislation changed so tow truck drivers could use red lights. "Emergency amber lights ... that's all we have," he said. "If we had a section of red that might slow [other drivers] down." Davis says the problem could be easily corrected if drivers showed more care and respect on roadways. "Slow down and give us some space, move over a bit. It doesn't hurt to go 70 km/h for two seconds, five seconds," he said.